Build Spiral Staircases easily with the new spiral staircase function. Create Piers, Slabs, or combination Pier/Slabs that auto-size to your base columns. Create Regular, tee, or tapered tee walls for refining structural design. Create concrete slabs with optional metal decking for floor design. New tools for automating drawing creation process from CADWorx Structure models. New capability for exporting your structural model directly to structural analysis. These are not recommended minimums; these are recommendations for high performance 3D modeling in AutoCAD/BricsCAD and CADWorx. 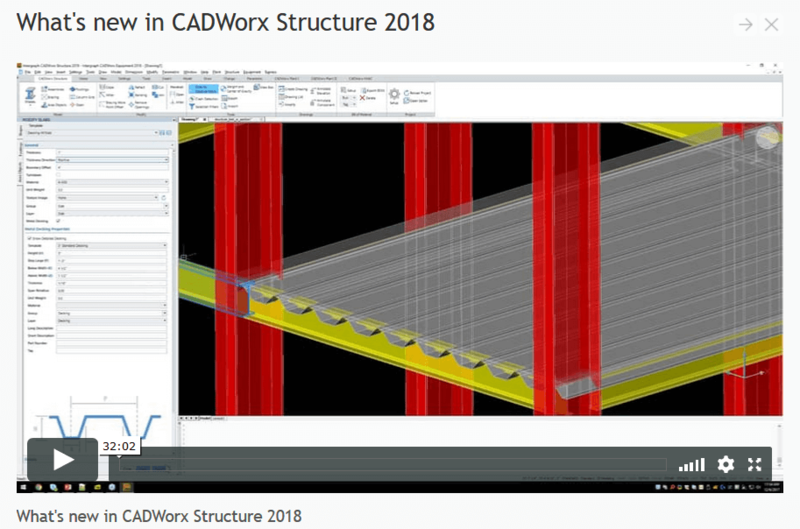 Gaining performance out of CAD applications like CADWorx or AutoCAD is a topic that has not been investigated thoroughly by formal benchmarks for a variety of different system configurations. However, there are recommendations that have been compiled here to assist IT and CAD Administrators in building CAD systems that are as efficient and cost effective as possible, given all known variables and information. Use of overlaid XREF hierarchy to manage different areas / disciplines when possible. Using smaller KB blocks to represent complex model geometry when possible. Separating Paper Space *.dwg deliverables from model *.dwg’s in your model space. Use of templates without any embedded blocks or un-needed information in each *.dwg. Training is available by ECE to better understand these concepts. AutoCAD/BricsCAD in general will write data to saved network drives often. Ensure you have a robust network with low latency and minimal to no packet loss. If this cannot be achieved, consider having users work locally, then save to the network. User Benchmark – This site crowdsources performance metrics for CPU’s, HDD’s, Graphics, and RAM so you can gauge the individual components against each other. PC Part Picker – This site allows you to walk through a wizard to build a system, and ensures that the components you select will all fit together. Operating System – Ensure you are on a 64-bit version of Windows, this allows you to install a 64-bit version of AutoCAD/BricsCAD to utilize more memory in each application. CAD Version – BricsCAD V17/V18 runs much faster than AutoCAD, and utilizes more of your computers hardware than AutoCAD does. BricsCAD can also run multi-threaded, for load and regen operations with the command MTFLAGS in settings. Regardless of your CAD environment, use the 64-bit version of either to be able to use more than 3.5GB of memory in the application. Processor –AutoCAD and BricsCAD will function faster with processors that have higher single core clock speed. This should be prioritized over multiple cores or other features on the chip. Server grade processors like the Xeon brand are more costly, and typically do not have higher single core speed, instead opting for more cores. These chips also require more expensive ECC memory, which is not required for CAD applications. Hard Drive Configuration– AutoCAD/BricsCAD and CADWorx will definitely see a performance boost when it comes to save/open operations if you consider solid state drives over Serial ATA drives. Currently PCIe NVME SSD’s are the fastest type of SSD’s available. These drives coupled with a RAID 0, 1, or 0+1 configuration can offer exceptional I/0 performance. Even greater advantage in read write speeds can be achieved using a RAM Disk, however this is achieved through a combination of software / hardware. Graphics Adapter– What is questionable about your graphics adapter is whether to spend almost 5 times more to buy an expensive “Business” type graphics card or the “gaming” type graphics card. Look for actual benchmarks that describe the performance benefit if you choose to go with a “business” grade graphics card. “Business” type graphics cards like the Nvidia Quadro line use ECC memory, where the goal is to minimize single-bit level errors in data. For purposes of advanced CFD simulation or FEA analysis we might see the benefit for going this route. For CAD applications, there just isn’t the benefit unless real performance can be derived from the card. RAM – RAM can easily be the most expensive part of your system, so make sure to do your research. Look for high clock speed, low CAS latency ram. Depending on the motherboard you select, you may be able to support quad-channel or dual-channel ram, which can also be beneficial. If you will routinely open multiple models within AutoCAD/BricsCAD on CADWorx, it may make sense to build a system with up to 64GB of ram. Any system with more RAM than this is most typically meant for server type applications, so 64GB should be as high as you want to go. Up to 64 GB RAM DDR4, or 32GB-16GB depending on the amount of models open at one time. For point cloud applications, 32GB-64GB of RAM should be considered.